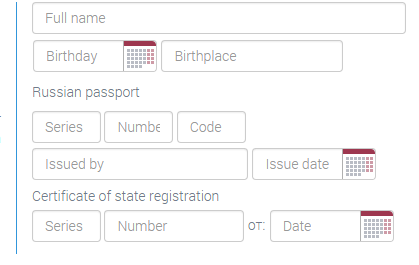 How to complete the fields? apps for iPhone and Android. an Individual with the ability to receive payments to QIWI Wallet. Choose a country, Russia or Kazakhstan. Please specify: Legal Entity; Individual; Legal Entity (Nonresident). Client Identifier is a general identifier for all company’s employees. This is a Latin name of the shop or the company which operates a number of shops. Login is a personal identifier of a particular employee who has access to your ROBOKASSA Client Account. The system uses the Login to identify the role of this employee in the company and grants access to some or other information. You can log in the system only if you type in your Login together with correct Client Identifier. Roles and access rights are distributed by the employee who plays the role of "Administrator". When the Client Account is created, the system creates an employee with the role of “Administrator” and respective rights by default. By default, he is offered login “admin”, which you can change immediately. Information will be sent to this E-Mail box to enable you to log in the Client Account. This E-Mail will also be used to restore access to the employee account. The password will be generated automatically and sent to the Administrator’s E-Mail together with other registration details. Using the Client Identifier and Login that you specified upon registration and the password, which was sent to your E-Mail, please sign in your Client Account. After you sign in, you can set your own password for access to your Client Account (change the automatically generated password), if you wish to do so. This is done at Settings – My Access – Preferences. You can skip the following steps and go further. We also advise you to complete the following fields in section Settings: My Access - Contact Info specifying your identification details and contact information. The first name, any middle names, and surname of a person. Please specify the full name (the first name, any middle names, and surname of a person) of the employee who will act as the Signatory. Official position of the person specified in the document certifying the right of signature. Document certifying the right of signature – E.g. : Articles of Association, Power of Attorney, Deed of Delegation. This field is required to be completed if this employee will sign official documents and be specified as signatory in the identification details of your legal entity. Fax number or additional phone number. Employee address, for example, home address. Additional information about the employee, which you want to save. Please complete the following information about your company in section “Settings” – “Legal data”. Please, select the desired property from the list. Please type in your Tax ID (Tax Identification Number). 10 digits for companies (OOO, OAO, ZAO) and 12 digits for Sole Proprietors. Please type in your Code of Reason for Registration, 9 digits. Please type in your Principal State Registration Number. 12 digits for companies (OOO, OAO, ZAO) and 15 digits for Self-employed person. General contact details (phone and fax) of your company and Finance E-Mail for electronic document exchange. Please specify all addresses you may have. If they are identical, please complete only one block and leave all others blank Fields “flat” or “office” are mandatory. The official address of registration, location address of the permanent executive authority of the legal entity. The actual address – the place where your company actually carries out professional activities. The address to which your company will receive correspondence. The executive body or an attorney of your company can act as the Signatory. All documents will be generated in his name. He is selected from the list or by clicking the button “Add”. Only those employees are admitted to this list, for whom the following fields are completed: Full Name Position Document. 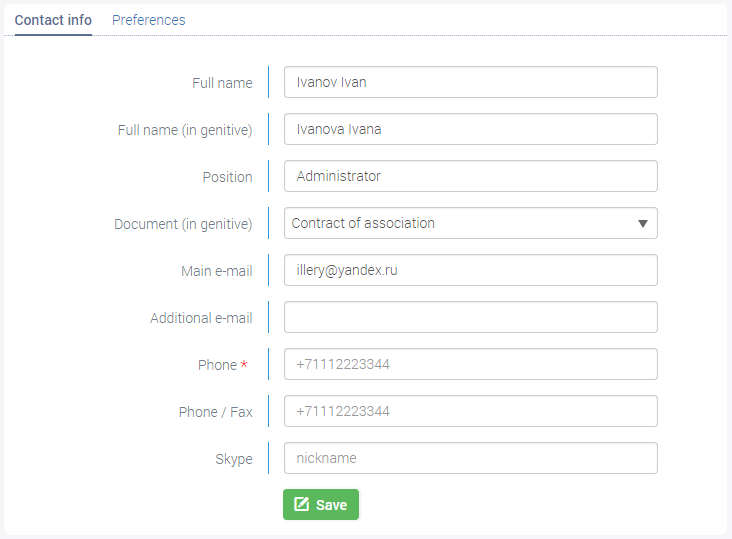 Please specify the employee of your company who will be the key contact person and whom we can contact for any inquiries that may arise during our cooperation. He is selected from the list or by clicking the button “Add”. Only those employees are admitted to this list, for whom the following fields are completed: Full Name, Email 1, Telephone 1. Enter your place of birth (as in passport). Please, enter the series and passport number, date of issue and the authority which issued the document. Please, enter the serial number of the certificate of registration of a person as a self-employed person, and the date of registration. Specify your QIWI wallet or Visa and MasterCard of the Russian bank. 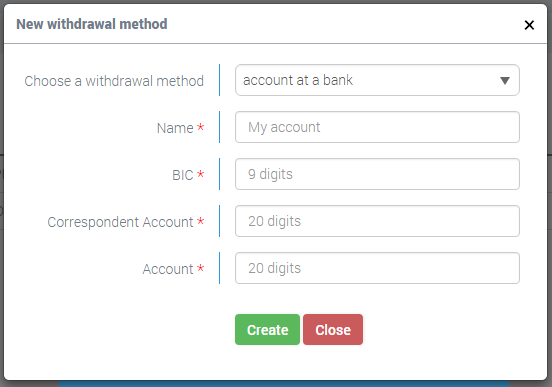 Please specify the details of your settlement account in section “Settings” – “Withdrawal methods”. This is done by clicking “Add withdrawal method”. Select the type of account with which you are going to work: cashless bank account or an ROBOKASSA Card. Please specify any simple name of this account. It may have any name that is convenient to you, i.e. any name which may come to your mind. Please specify the Bank Identification Code of the bank with which your settlement account is opened. Please specify the Correspondent Account of the bank with which your settlement account is opened. You can create your shop either on the homepage of your Client Account or in section “My Shops” by clicking the button “Add New”. Please complete all fields as appropriate at this page. As an individual only for billing. After activation, the store can not change its type. This name will be shown to the client upon making payment through our interface. May contain no more than 40 characters. This field needs to be completed if you haven’t previously completed section "Addresses". In other words, this is the address of your website homepage. E.g. http://www.robokassa.ru/. This URL will be used in section Technical Settings which will become available after you create your shop. Attention! After you activate your Shop, you will not be able to change this URL! To be selected from the list, unless it was designated previously. Or you can create it by clicking button “Add”. This is your employee who will be responsible for liaison with ROBOKASSA on general issues and whom we can contact at any time. Those employees are admitted to this list, for whom the following fields are completed: Full name, E-Mail1 and Telephone. This is your employee who will be responsible for liaison with the buyers on the issues relating to processing of payments and delivery of goods. Those employees are admitted to this list, for whom the following fields are completed: Full name, Position, E-Mail1 and Telephone. Please specify the section where your Shop will be placed. If you chose category “Other Goods” or a category which does not fully describe your operations, please provide more detailed information. E.g. select Section “Other Goods” and specify “discount coupons” as additional description. Please note that after you activate your Shop, you will have to generate a separate data change request in order to change the catalog sections that you associated with your Shop. Your request will be processed by our specialists. If you choose "Other products" or a category that does not fully disclose your activity, please specify the information in more detail. For example: The "Other products" category and describe further – "discount coupons". After completing all details, please remember to click green button “Create”. Otherwise, the Shop will not be saved in your Client Account. You can quickly switch to the settings of a particular store from the general list, which is visible on the front page and in the "My Shops", by pressing the "Shop settings" represented as an icon (see Picture). You can make changes to this section at any convenient time during or after Shop Activation. The Shop Identifier which you specified when creating the Shop is indicated in the first line. It specifies the method by which the parameter SignatureValue value will be calculated. The following algorithms for calculating hash: MD5, RIPEMD160, SHA1, SHA256, SHA384, SHA512. For more information about hashing algorithms can be found here. This is for the payment initiation interface. It must by at least 8 characters long and contain at least one letter and one digit. This is for the payment notification interface and XML-interfaces. It must by at least 8 characters long and contain at least one letter and one digit. These passwords must be different and under NO circumstances they may be the same as the password for log in your Client Account. For security reasons, the passwords will not be shown on the screen. Please write down/save both passwords and keep them in a safe place. You will need them for further setup of the scripts. We will use this URL to automatically notify you of successful payments. Without this URL, we do NOT guarantee correct operation of our system. Please specify the method you would like to choose to receive information from us through these URL. Your technical specialist should know the Method of Data Dispatch or it can be specified in the operation manual to ROBOKASSA module in CMS you operate. If your website (shop) operates so that every transaction is processed manually and payments are tracked by your employee, you may set up automatic email notifications. To do so, you should select E-Mail as the Method of Data Dispatch in field ResultURL and type in your E-Mail box, where you wish to receive notifications. Attention! This is a chargeable service. The buyer will be redirected to this URL after successful payment. Near this URL you can find setting – Method of Data Dispatch. Please specify the method you would like to choose to receive information from us through this URL. Your technical specialist should know the Method of Data Dispatch or it can be specified in the operation manual to ROBOKASSA module in CMS you operate. The buyer will be redirected to this URL after unsuccessful payment or failure to pay. Used for testing the shop payment initiation interface. Length must be at least 8 characters, must contain at least one letter and at least one digit. Used for testing the shop payment notification interface, and XML-interfaces. Length must be at least 8 characters, must contain at least one letter and at least one digit. Passwords for test payments must not coincide with the working password shop. Please note that if section Technical Settings is not duly completed, your website (shop) will not work properly with ROBOKASSA and your request for Activation will be denied. Details in section Technical Settings can be changed and saved without additional confirmation before Activation of your shop. After Activation, in order for your changes to be saved, you will need to enter the Confirmation Code which will be sent to the E-Mail of the employee who made these changes. The Code will be valid for 20 minutes. After this, all changes you've made will be reversed. If this information appears, you should check whether you correctly completed details of the Legal Entity and section Technical Settings. 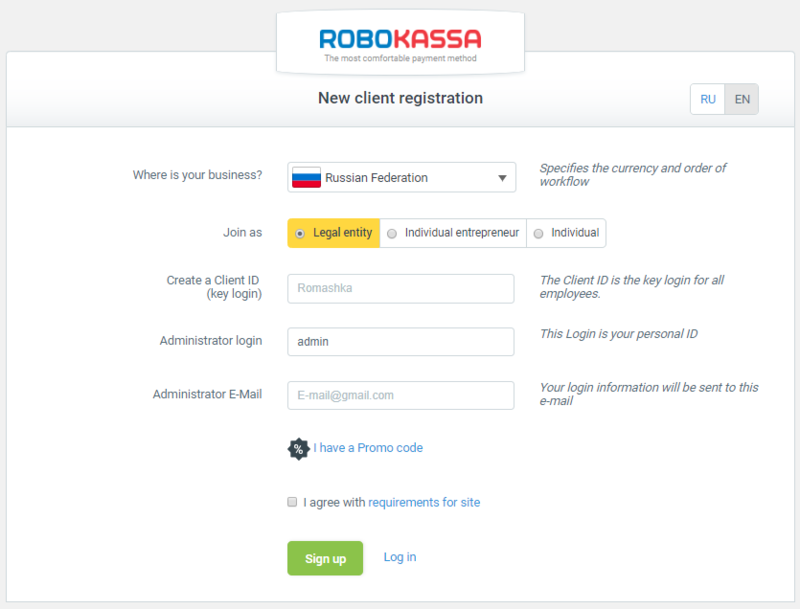 Finally, you registered your Store, and now you need to take an important step - to install ROBOKASSA script on your website and make all necessary settings. Or you can have a look at the off-the-shelf modules and operation manuals for different CMSs placed on this page. For a start, we will see what parameters and variables are used in the scripts and what values can be used for them. And also what exactly do we need from all of this and for what. Nothing will work without them! Means the Shop Identifier in ROBOKASSA you specified upon creation of the Shop. Means the amount payable (in other words, the price of the order placed by the client). The format of presentation – dot-delimited digits. For example 123.45. The amount should be denominated in RUB. However, if the prices are denominated (e.g.) in USD on your website when issuing the invoice you need to specify the amount converted from USD to RUB. Means description of the purchase. Only English or Russian letters, digits and punctuation marks may be used. Maximum 100 characters. In other words, this is the name of the goods the client is purchasing. This information is not reflected in ROBOKASSA interface and the E-Receipt we issue to the client after completion of payment. It may be reflected correctly if the optional parameter Encoding is activated (see Optional Parameters). SignatureValue – checksum or hash sum, a line of a 32-bit 16-nary number in hex format and any register (totally 32 characters 0-9, A-F) calculated by the method specified in the Technical Settings of the shop. It is generated in the line containing the following parameters delimited by ‘:’ followed by Password#1 (you prescribed this password when completing section Technical Settings): MerchantLogin:OutSum:InvId:Password#1 — if the parameter InvId has been transmitted, and: MerchantLogin:OutSum::Password#1 if the parameter InvId has not been transmitted. This is a very important parameter which ensures the security of payment and integrity of data transmission. If it is correctly compiled, no intruder will be able to forge any data in the payment transaction. 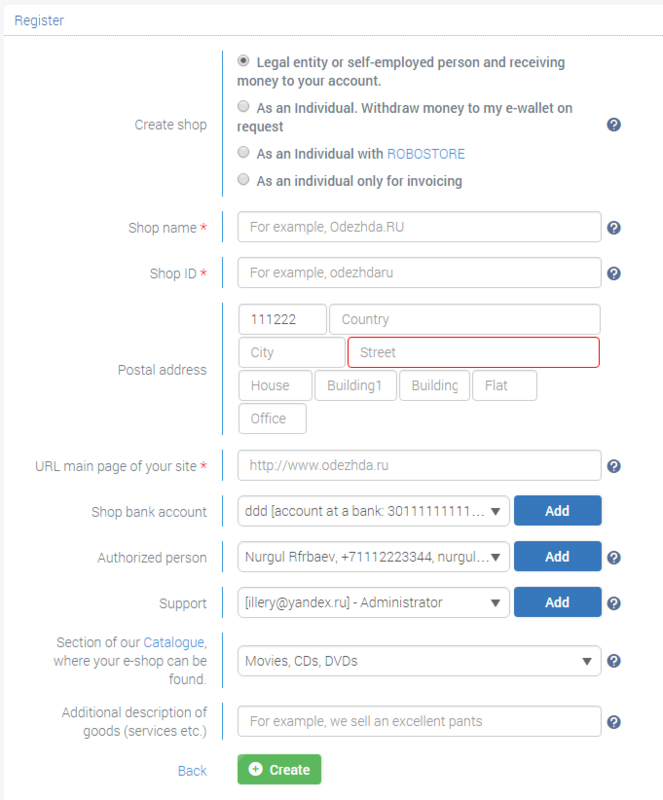 You may skip this block, if you do not wish to make a complex script or payment page, and proceed to section Simplest shop without an option to generate unique invoice number. Means proposed currency of payment. This is the payment option you recommend to your buyers/users.If this parameter is specified, then the buyer during the transition to the site ROBOKASSA will get to the payment page to select a payment method. The user may change it in the process of payment. The values for IncCurrLabel, i.e. currency labels, are available in section XML interfaces. Get Currencies Interface. Means your invoice number. The optional parameter, but we strongly recommend using it. It should be unique each time your client is redirected for payment to our system. It may vary from 1 to 2147483647 (2^31-1). If it contains an empty value, is not specified or equal to zero, then we will assign unique invoice number automatically when initiating the transaction. It is advisable to use this option only in very simple stores, where no control is required or only one type of goods is offered. If this parameter is passed, it should be included in the calculation of the checksum (SignatureValue). Optional, means language the client will use to communicate with your website. It can have the following values: en, ru. This is in accordance with ISO 3166-1. i.e. you initially choose the language of ROBOKASSA interface the client will see. If no language is chosen (used), then the language will be as in the regional settings of the client’s browser. If the regional settings are other than Russian, then English will automatically switch on. Means encoding, in which cash-desk HTML code will return. By default: windows-1251. The same parameter ensures that purchase description (sInvDesc) is correctly displayed in ROBOKASSA interface and that Additional User Parameters are correctly translated if their values are in a language other than English. 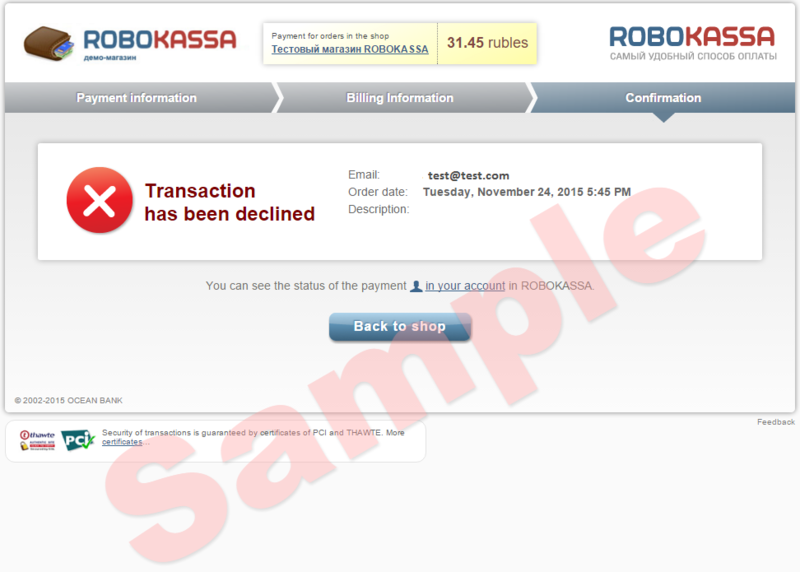 The buyer’s E-Mail is automatically inserted into ROBOKASSA payment form. The user may change it in the process of payment. It will be used if the user already specified his contact E-Mail on your website. Invoice expiration date. This parameter is used to forbid the ability to pay for user later than the date of issuing an invoice by the store. It should be noted that, in some cases, if the payment is made offline, for example: using the terminal or service of mobile shops, payment will be able to effect later than the expiration date of invoice. o symbol «Z» (should be in uppercase) indicates that the point in time represented in zone UTC (equivalent to 00: 00 and -00: 00). OutSumCurrency is the way to specify currency, where the shop issues the order value. The shop uses this parameter to avoid manual conversion of exchange. OutSumCurrency is additional parameter to OutSum. If this parameter is used OutSum will show the entire order value in currency which is specified in the OutSumCurrency. In this instance, the entire sum will be re-counted according to the exchange rate of the Central Bank of Russia Federation on the day of payment and will be paid to the shop. It can have the following values: USD, EUR and KZT. If you pass a parameter OutSumCurrency, it must be included in the calculation of the checksum (SignatureValue). In this case, the basis for calculation will look like this: MerchantLogin:OutSum:InvId:OutSumCurrency:Password#1. The Additional User Parameters are also optional but are for completely different purpose. These are those parameters which ROBOKASSA never processes but always returns to the Store in response messages. You are opening a store, which will offer a wide range of goods, sections, and product types. Your website will offer a variety of different services. A number of resources base on the same website. And most common, if you need to use additional identification information of your clients, e.g. need to know his ID or Login on your website. Then when starting a payment transaction you can transmit all this information to us. They may look like this: Shp_1=1; Shp_1=2 and etc, or Shp_oplata=1; Shp_oplata=2 and etc, or Shp_login=Vasya; Shp_name=Вася. Upon receiving notification from the ROBOKASSA, you (your script) can use them at your discretion. As an example, you will decide where to redirect the buyer and what to show him and what steps to take in principle. t is very important that all parameters are listed alphabetically, if you have more than one parameter. If any user parameter is in Cyrillic letters (Shp_name=Вася), ), then it must be URL-coded before using it to calculate SignatureValue and sending it in the form. If you make a GET request, this parameter must be URL-coded again immediately before generating the request for initiation of payment. A line in the sum can contain up to 2048 characters. Each of these parameters MUST be included in the calculation of the checksum (SignatureValue). As at the start of operation and at its completion. All parameters must always be sorted in alphabetical order. For Robokassa customers, who chose Cloud Solution and Cash register Solution. A new parameter was added to the protocol. This parameter transfers information about the list of goods/services, quantity, price and tax rate for each item. The format of the parameter is json. The parameter is included in the control signature of the request (after the account number of the store). For example: MerchantLogin:OutSum:InvId:Receipt:Password#1. Attention! The sum field contains the price for all units of the given product together, taking into account (if any) discounts, bonuses and special/premium prices for individual items of the product (for example, the third product for half the price or five units for a 12% discount). Attention! Due to the fact that the value of this parameter can be long, we recommend sending requests with this parameter only using the POST method, in order to avoid exceeding the maximum length of the query string. IMPORTANT! The value of the Receipt parameter before use on the line for calculating the checksum and sending it to the form must be URL-encoded. An optional field if the organization has only one type of taxation. «patent» – a patent ST.
An array of data about the positions of the check. Mandatory field. Name of product. String, the maximum length is 64 characters. Mandatory field. The price in rubles for all the quantity of this product, taking into account all possible discounts, bonuses, and special prices. Decimal number: the whole part is not more than 8 characters, the fractional part is not more than 2 characters. Mandatory field. Quantity/weight of a particular heading. Decimal number: the whole part is not more than 8 characters, the fractional part is not more than 3 characters. This field sets the tax amount in the Cash registers. It is determined for each type of product individually, but for all units of a particular product together. «vat118» – VAT (Value Added Tax) of the check at the estimated rate of 18/118. Recurrent payments can be necessary for some shops, for example periodical, monthly subscriptions, etc. The special parameters are used to make such kinds of payments easier. On the first stage, user effects a common payment but it is required to add the special parameter along with the others. This parameter shows that this payment will be recurrent. After successful payment of the invoice, using a bank card shop gets the ability to effect the payment recurrently without user involvement. 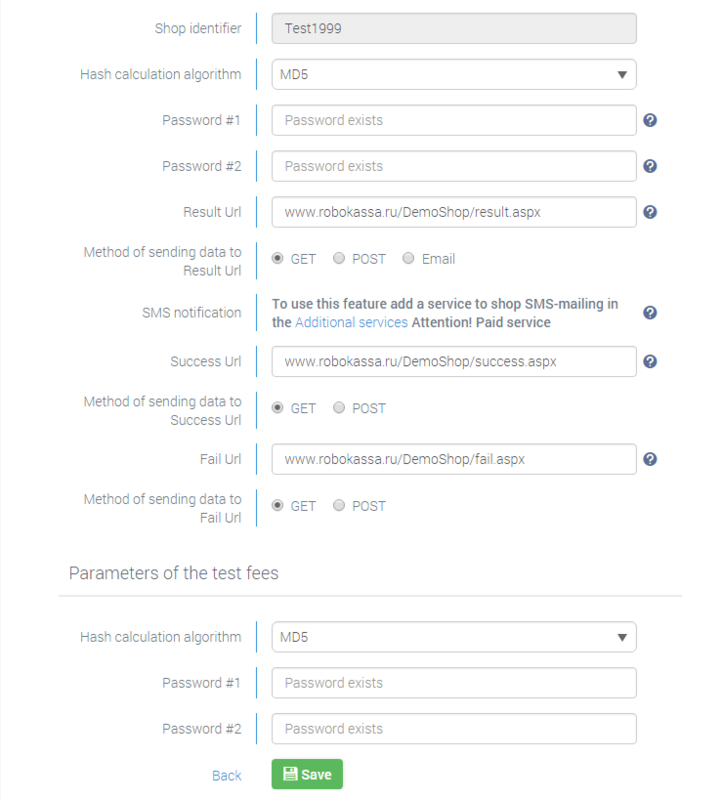 To do so, the shop makes a request to the special URL (https://auth.robokassa.ru/Merchant/Recurring) transferring the common parameters and specifying the invoice number that was paid on the first stage. This parameter shows that this payment will be recurrent. The parameter is set to true. Parameters IncCurrLabel, ExpirationDate, Recurring must not be included. 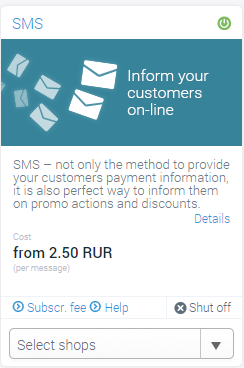 Service SMS-messages will allow you to quickly and promptly receive information about the receipt of payment to your shop, as well as transfer information to your customers and report them about the procurement and the creation of the order. After every purchase made in your shop, Robokassa provides an opportunity to send 3 SMS-messages to the buyer. In the Technical settings of this shop, prescribe the phone number to which you want to receive SMS-messages about payment of the order. connect the SMS service on your side. The service is located at https://services.robokassa.ru/SMS/. The service accepts requests using the GET method. An example of a query can be found here. Each shop is connected to the service of sending SMS separately (if there are several of them). The cost of the service can be found here (p.25). You can send SMS messages only if you have enough money on your balance to send. A string containing your Shop ID in the Personal Account on the ROBOKASSA website. A string containing the phone number in international format without the symbol «+» (79051234567). A string in UTF-8 encoding up to 128 characters long, containing the text of the SMS. The string containing the electronic signature is a hash, calculated when sending an SMS message. The algorithm for calculating the hash is in the Technical settings of the shop. The electronic signature is calculated from the string containing the following parameters, separated by the symbol ':' login: phone: message: Password#1, where Password#1 is the password you came up with during the filling of the Technical Settings section. Do not confuse this parameter with SignatureValue! Suppose, you decided to send an SMS to the shop with the demo_merchant login to the number 79051234567 with the text "All work fine!". Password#1 is located in the Customer's Personal Account in the Technical Settings of this shop (the client may have several shops). For example, the value of Password#1 will be Password1drowssaP. Thus, the string for the signature will look like demo_merchant:79051234567:All work fine!:Password1drowssaP. The signature of MD5 for this request will be as follows: 6f0ed2dbb08da5a50124a3ee0581a7f6. The signature of SHA1 will be: 271f256595a8adc63438a3d75e14c20bc3fabe85. The value of a logical type indicating the overall success or failure of processing the request. Please note that this parameter has nothing to do with ResultURL! The integer value indicating the amount of SMS available after this request (this value is filled only if the request is successfully executed). The integer value of the processing error code (0 - successful processing). The text description of the error that occurred during processing. The request can be considered successfully executed if the field result = true and errorCode = 0. 9999 is an internal error. 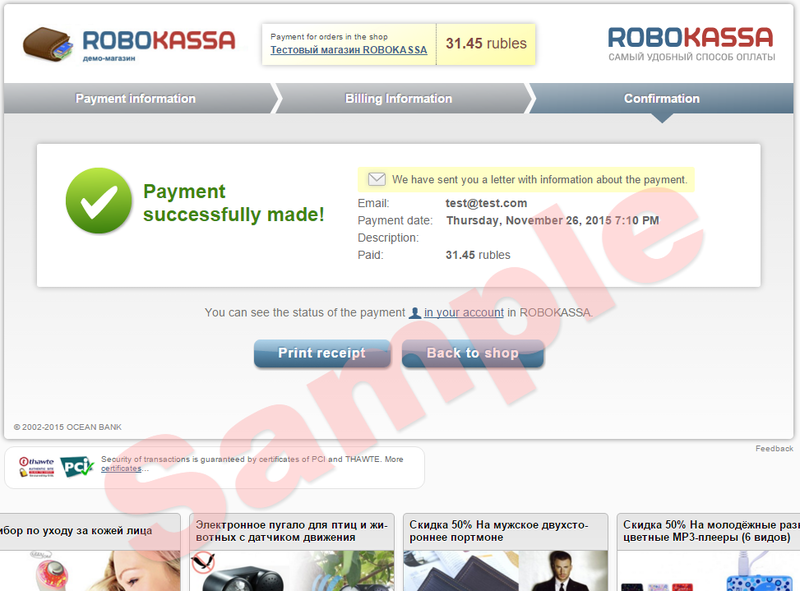 This is ROBOKASSA interface which offers to proceed to payment by clicking one button. You can see other variations of buttons here. Means the amount payable (in other words, the price of the order placed by the client. See Optional Parameters OutSumCurrency). Means your invoice number. The optional parameter, but we strongly recommend using it (see Optional Parameters). MD5 SignatureValue – checksum or hash sum, a line of a 32-bit 16-nary number in hex format and any register (totally 32 characters 0-9, A-F). It is generated in the line containing the following parameters delimited by ‘:’ followed by Password#1 (you prescribed this password when completing section Technical Settings): MerchantLogin:OutSum:InvId:Password#1 — if the parameter InvId has been transmitted, and: MerchantLogin:OutSum::Password#1 if the parameter InvId has not been transmitted. Detailed description of all used parameters and their values you can find here. Please, note that this example assumes that algorithm for calculating the hash MD5 was selected in the Technical settings of the shop. 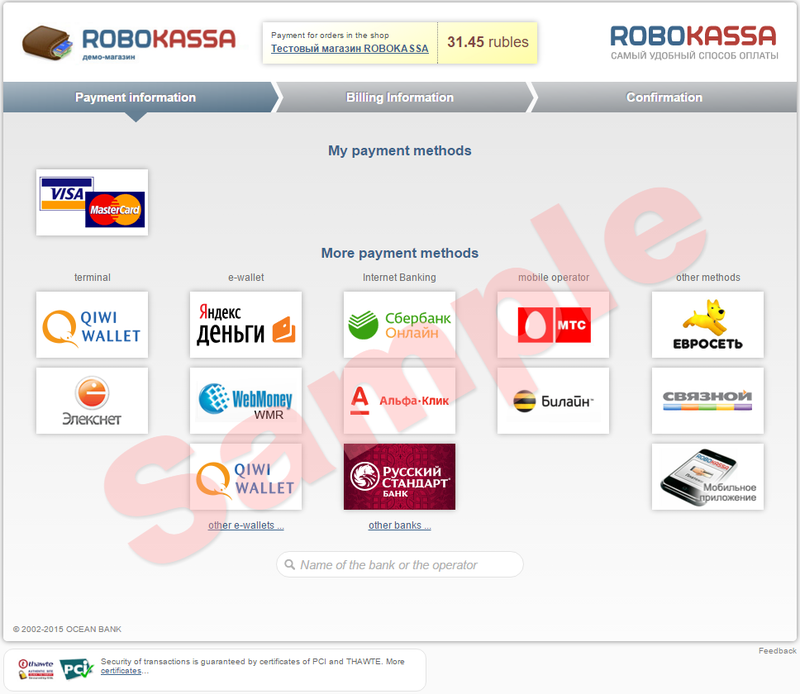 To pay buyer goes to payment interface ROBOKASSA, chooses a payment method and makes a payment. Then the funds are transferred to your balance in the system ROBOKASSA, and we will send payment notification to your ResultUrl which you have registered. The code generating a request to ROBOKASSA. ROBOKASSA will return HTML code of the form (see below) in response to the request. The above example assumes that in the Technical Settings of the shop selected algorithm MD5 for calculating a hash. Parameter OutSum is omitted in this script. Instead DefaultSum — is used, an amount displayed (offered for payment) in the form by default. There is also empty space in the formula to calculate SignatureValue instead of the order price: "$mrh_login::$inv_id:$mrh_Password#1". Please note! Parameter OutSum is not used at all in this script! Please see more detailed description of all parameters and their values here. Example of the code (PHP) to be installed on the website. Detailed description of all used parameters and their values you can find here. Please, note that this example assumes that algorithm for calculating hash MD5 was selected in the "Technical settings" of the shop. You can choose the size and look of the pay button and amount input form. Below are possible variations of the buttons and forms, as well as URLs which need to be used to obtain respective button/form. ResultURL is intended to automatically notify your website of successful payment. In the case of successful payment, ROBOKASSA makes a request to ResultURL specifying the following parameters (using POST or GET method depending on which of them is selected in settings) OutSum, InvId and SignatureValue. The data is always transmitted in UTF-8. Means the amount payable (in other words, the price of the order placed by the client). Email, indicated by the buyer during the payment process. Robokassa fee for the transaction. The Commission is charged according to the client's tariff. Thus, the Robokassa Commission is deducted from the amount paid by the buyer (parameter OutSum), and the amount of OutSum minus Fee will be credited to the account. For clients connected as an individual, the Fee parameter is always 0. SignatureValue – checksum or hash sum, a line of a 32-bit 16-nary number in hex format and any register (totally 32 characters 0-9, A-F) calculated by the method specified in the Technical Settings of the shop. If this is the case, SignatureValue will be calculated by the following formula: OutSum:InvId:Password#2 — if you did not transfer User Parameters and: OutSum:InvId:Password#2:[User Parameters] if you transmit User Parameters. — then the signature will be generated from the line: 100.26:450009:Password#2:Shp_login=Vasya:Shp_oplata=1. About Password#2 you can read in the Technical Settings. The script of ResultURL must check that the resulting of checksum is correct and matches the SignatureValue you have calculated according to the parameters you receive from ROBOKASSA, but not according to the local data of the shop. If the checksums are equal, then your script should respond ROBOKASSA, that we understand that your script is working correctly and repeated notifications from our side is not required. The result must contain text OK, and setting InvId. For example, the result must contain OK5 for invoice number 5. If the checksums are not equal, then the received message is incorrect, and the situation requires parsing by the shop. If E-Mail was selected in settings as a method of data dispatch, then in a case of successful payment ROBOKASSA will send you email containing all above listed parameters to the mailbox specified in the field ResultURL. If the payment is successfully completed, the Buyer may follow a link you specified in the Technical settings using the method you selected (GET or POST). Once the user follows this link with correct parameters (SignatureValue is matched), this will mean that the payment is successfully made. However, for the purposes of additional protection, it is advisable that the payment is verified by the script that will be exercisable upon redirection to ResultURL or by way of making a request to Operation State XML Interface, and provided only that the invoice number InvId exists in the store database. As a matter of fact, the redirection of the user to SuccessURL is a formality, which needs only to return the user to your website and provide information to him that he did everything right and his order is waiting for him at a certain place. And you are required to confirm payment in your database and take all other steps necessary to deliver the purchase upon receipt of a notice to ResultURL. Indeed, this is where we automatically transmit details in support of payment (i.e. in any case and without the need for any steps on the part of the user). In the case of failure to make payment, the Buyer will be redirected to the following URL. Means language the client will use to communicate with your website. It can have the following values: en, ru. This is in accordance with ISO 3166-1. i.e. you initially choose the language of ROBOKASSA interface the client will see. Generally speaking, the redirection of the user to this address does not necessarily mean that the Buyer finally refused from making payment, because he can return to ROBOKASSA page by clicking the button "Back" in his browser. Accordingly, if the goods in stock are blocked for this order, in order to unblock them, it is advisable to verify the fact of failure to pay by giving request to XML interface for the results of this transaction, specifying invoice number nInvId existing in the Merchant’s shop database. XML interfaces are intended to create full-fledged ROBOKASSA interface with various information blocks for the clients of your store/website and to ensure deeper cooperation between your store/website and ROBOKASSA. Attention! Outdated XML interfaces are described here. Means the result of the request. If successful - 0, otherwise the error code is specified. If when processing a request, an error occurs, the response will not contain any additional elements with the requested data. Means text description of the result of the request. Returns the list of currencies available to pay for the orders from a particular store/website. It is used to specify the value of IncCurrLabel and to display the available payment options right on your website if you wish to give more information to your clients. Means Store Identifier, line. Details can be found here. Means language for the localized values in the response (currencies, payment methods and etc.). Means groups of currencies; can be used to display currencies in a more convenient way in the user interface. Means text description of the group. Means currencies of the group. Returns the list of payment methods available to pay for the orders from a particular shop/website. It is used to display the available payment methods right on your website if you wish to give more information to your clients. The key difference from the Get Currencies – is that no detailed information is shown here for all payment options, while only payment groups/methods are displayed. Means code of the payment method. Means text description of the payment method. Helps calculate the amount payable by the buyer including ROBOKASSA’s charge (according to the service plan) and charges of other systems through which the buyer decided to pay for the order. It may be used both for your internal payments and to provide additional information to the clients on your website. Means code of the currency for which the amount payable needs to be calculated. If this parameter is left blank, the calculation will be made for all available currencies. Means the amount the store wishes to receive. On the basis of this amount and prevailing exchange rates for each currency/payment option in the list, the amount payable by the client will be calculated. Means amount payable by the user including service charge. Helps calculate the amount receivable on the basis of ROBOKASSA prevailing exchange rates from the amount payable by the user. Means amount payable by the user. Means the amount the store wishes to receive. Returns detailed information on the current status and payment details. Please bear in mind that the transaction is initiated not when the user is redirected to the payment page, but later – once his payment details are confirmed, i.e. you may well see no transaction, which you believe should have been started already. SignatureValue – checksum or hash sum, a line of 32-bit 16-nary number in hex format and any register (totally 32 characters 0-9, A-F) calculated by the method specified in the Technical Settings of the shop. It is generated in the line containing the mandatory parameters delimited by ‘:’ followed by Password#2 (you prescribed this password when completing section Technical Settings): MerchantLogin:InvoiceID:Password#2. 5 – initiated, payment is not received by the service. Input money state. This means that the user has not paid or payment system through which the user makes the payment has not confirmed the payment yet. 10 – payment was not received, operation canceled. Payment has not been made. The buyer refused to pay or has not paid, and the operation is canceled due to timeout. Either the payment was made after the timeout. In the case of contentious issues at the request of the shop or buyer, the operation will be rechecked by customer support, and depending on the results can be transferred to another state. 50 – payment received, payment is transferred to the shop account. Money transfer state. This means that the money is credited to a shop account. In this state, the payment may be delayed for a while. In case of failure to notify the store of money on admission ResultUrl (url unavailable or your script generates incorrect answer) will be a delay of about 5 minutes. If the payment is in this state for a long time (over 20 minutes), it means that there is a problem with transfer funds to the shop. 60 – payment was returned to buyer after it was received. The payment returned to the buyer account (wallet) through which the buyer made the payment . 80 – operation execution is suspended. Halt. This means that there was an emergency situation in the transaction (payment interfaces are not available in the payment system etc.) or the operation was suspended by security system. Operations that are in this state will manage by our customer support in the manual mode. 100 – operation completed successfully. Payment is carried out successfully, the money credited to the balance of the shop, notification of successful payment sent to the shop. date/time of the request response. Date / time of last change of payment operation state. Means code of the currency used by the client. The sum paid by the client, in units of currency IncCurrLabel. Client account number (wallet, credit card number) in the payment system, used for paying. payment method selected by the client. currency received by the shop. sum credited to the shop account in the OutCurrLabel currency units. "Z" symbol (must be in the uppercase), means that time is represented in the UTC zone (equivalent to +00:00 and -00:00). 3 – information about the operation with with such InvoiceID is not found. 4 – Two operations with the same InvoiceID found. Using XML-interface for calculating the amount payable, you can pay ROBOKASSA commission for the buyer (only for Individuals). The invoicing in ROBOKASSA remains the same; the system will add a commission to the amount that you transmit to us for invoicing. The interface allows you to calculate the amount your shop will receive so that the buyer does not pay ROBOKASSA commission. Let us assume that a product or service on your site is worth 100 rubles. If you divert the buyer to the ROBOKASSA payment page with this sum, our system will add to the 100 rubles a commission for example – 5%. As a result, the customer will be invoiced at 105 rubles. Now we use this XML interface and make sure that the buyer paid $ 100, not 105, and your shop compensates ROBOKASSA 5% commission. The calculation must be carried before forwarding a client. If the product or service on your site is worth 100 rubles, you are using an XML interface, calculate the amount your shop will get if the buyer pays exactly 100 rubles using the selected payment method. ROBOKASSA returns you to the amount that was calculated let it be 95.24 rubles. Please note that the calculation is correct only for the chosen method of payment! Now you can make a request to initialize the payment and specify as a parameter value OutSum 95.24 and as IncCurrLabel – $ inccurrlabel. Do not forget that in the request for the payment initialization you must specify the parameter IncCurrLabel with the same label of currency that you used when calculating the amount. Such shop is unable to control the receipt of payments and you will likely have to assign payment statuses and dispatch goods to the buyers manually. the user, after he has chosen the payment method and clicked the "Pay", is redirected to ROBOKASSA, page, where he makes the payment (and the money in your currency are credited to the shop’s account). upon completion of the process, notice of successful transaction is given to the E-mail of the shop operator. The algorithm for calculating the hash – MD5 (default). Fail URL – URL to which the buyer will be redirected after unsuccessful payment, the method of data dispatch is of no importance (this may be the website homepage or the page saying to the client that his payment is unsuccessful). The script for such a store must be the simplest. Actually, it is not even the script what is needed, but the link to proceed to the payment page. It is recommended to use the simplest text editor – Notepad. Now we insert the details we already have as described in Mandatory Parameters. This is done by replacing the variables with the appropriate values. The following link will be generated: https://auth.robokassa.ru/Merchant/Index.aspx?MerchantLogin=demo&OutSum=11&Description=Purchase in demo store&SignatureValue=[value]. The last parameter SignatureValue is missing in the resulting link. And we have to calculate it. [password#1] – this is the password you specified when completing section Technical settings. Please note! Parameter InvId is used at in the counting SignatureValue with an void value. Following these steps, you will generate the link to be placed on your website without the need for any additional programming. And you can start accepting payments. 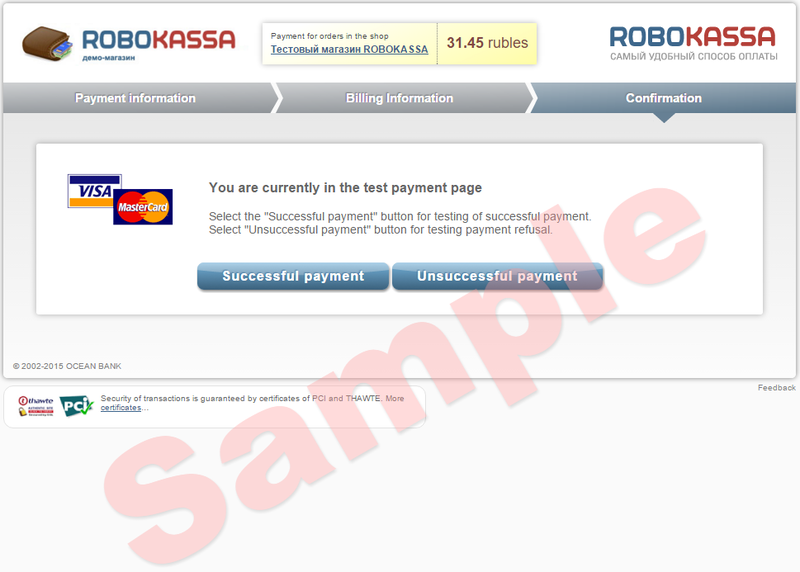 after the payment is made the user is redirected to SuccessURL – ROBOKASSA transmits the same parameters as to ResultURL, but these ones are signed using Password#1. Following these steps, you will generate the link to be placed on your website without the need for any addition. The use of all ROBOKASSA options, such as Additional User Parameters and XML Interfaces, will enable you to integrate your shop into our system as deeply as possible. This will ensure higher flexibility in using ROBOKASSA which will help you provide services to your clients at a totally new level. XML Interfaces help in advance obtain exchange rates ROBOKASSA and the list of acceptable currencies, as well as calculate both the amount receivable by the shop and the amount payable by the buyer. This will significantly enhance your opportunities in building up a convenient user interface on your website. Further, you can at any time check the payment status. This will provide higher stability and security to your operations. For example, your system will automatically check payment status directly with before delivery of the goods ROBOKASSA. And if you prescribe Additional User Parameters, you will be able to tune up your website operation so that to offer the maximum comfort to your clients and employees. Specifically, this will enable you to distribute cash flows inside your resources from the services or goods that you offer. Alternatively, these parameters can be used to additionally identify your clients. This is often needed to ensure that the payment is credited correctly. If you wish the client to pay an invoice only after your manager checks the order and the client approve the supply package, or if you have no website and work, e.g. by phone, or you may find it difficult to understand all the technical aspects of connection to our system or have no money to engage a programmer, then it is advisable to use this mode of operation. In the Client Account, you may find section "Invoicing", which represents a user-friendly interface to create and email to the client the link to the payment page for a particular order which was checked by your manager and agreed with your client. Register at our website http://www.robokassa.ru/. 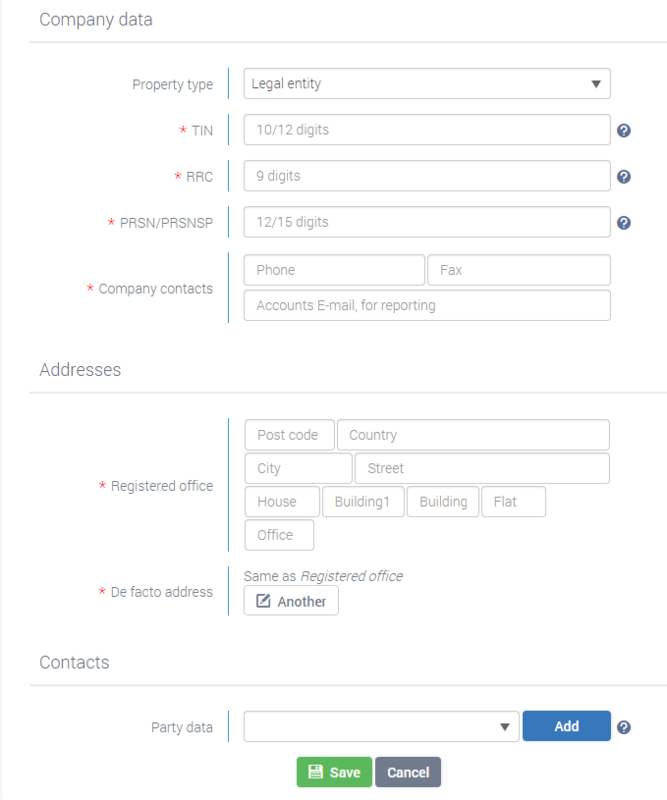 In fields ResultURL, choose E-Mail as a method of data dispatch and specify the mailbox where you want to receive notices of successful payments to be further processed by your manager. No other additional settings are needed, provided that you plan to work only manually. i.e. 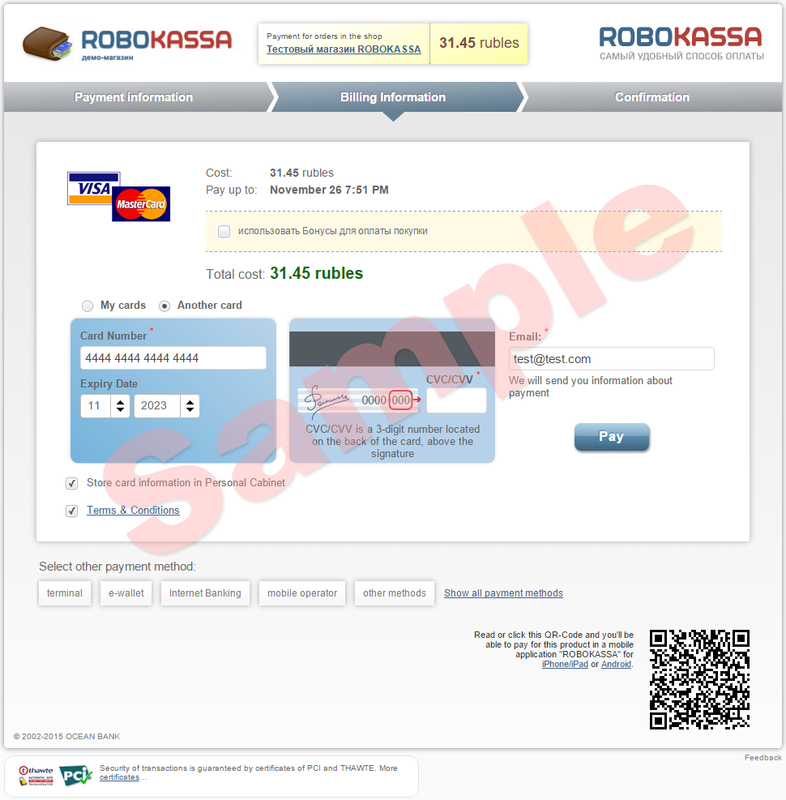 even if the user moved to ROBOKASSA, the interface from your website, selected (or viewed) the payment option, but did not initiate the transaction by clicking the button "Pay"/"Checkout", no records will be kept in ROBOKASSA system. Certain payment methods may provide for 1-2 hour timeout, while others may require from one day to a week. Bank cards and electronic payment systems (e-money): WebMoney, Yandex.Money, WalletOne and etc. – the time allocated for payment is 45 minutes. For terminals: QIWI, Elecsnet, and etc – the time allocated for payment is two days (48 hours). Except for QIWI – one day (24 hours). For online-banking systems: Alfa-Click, VTB24, QBank, Petrokommerz and etc. – the time allocated for payment is 1 day (24 hours). For ATMs – the time allocated for payment is 1 day (24 hours). There are some other aspects that you should also pay attention to – the user made payment, but the waiting period (usually if the payment is made by e-money) expires or the system through which the payment was made fails to send us confirmation of such payment and it was cancelled in our system, or the payment was made with an error and additional identification and corrections are required to be made manually. And after this, the client communicates that he made payment, but received nothing. So he then starts looking for his money and goods. This may happen on the same day, after several hours or months. If payment is actually confirmed, ROBOKASSA takes all necessary steps to complete the payment and send you a notification about this. Accordingly, this can happen after a long period of time. Normally, no more than a day, but sometimes it can be a long delay. The test environment is an interface "payment page" ROBOKASSA, but without the ability to carry out the payment. It allows you to debug the process of payment and use test XML-interface obtaining the status of payment. To work in test mode required parameter is IsTest. Attention! To work in text mode use a special test set of passwords that do not match with the basic working password of your shop. They are written in a special unit in the Technical setttings of your shop. This is done to ensure the security of your online shop, so the attacker was not able to "cheat" your online shop. Working in test environment requires an additional set of passwords that may not coincide with the Password#1 and Password#2. They are found in a special section of Technical Settings. There is chosen for calculating the hash algorithm for test payments. Checksum algorithm for the test mode must be the same workers. You can initialize a test payment via your ROBOKASSA Personal Account, through your shop using the modified script or manually assemble a link to the payment page ROBOKASSA. 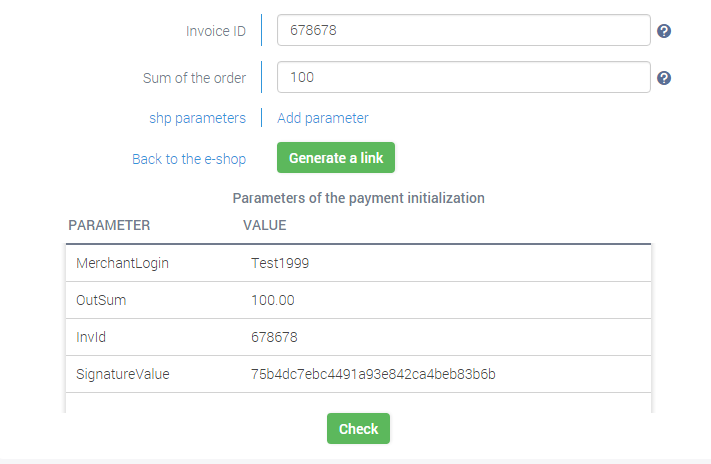 In order to initiate test operation of payment through your shop, you must add the parameter IsTest with the value 1 to the script. If this parameter is absent, or as a parameter value IsTest was transferred to 0, or the value is empty, such a request is not considered as a test payment and initializes the normal payment operation. Set the notify of payment on ResultURL to work with the test interface. This will require a Password#2 from the test parameters into an accounting of SignatureValue. After saving these settings, you can initiate a test payment operation from your shop. As a result, you find yourself here, and you can continue to test the payment process in your shop. Let us consider test details of payment via ROBOKASSA Personal Account. Please note that the test through ROBOKASSA Personal Account not a substitute for a shop test via the shop's website. Enter your invoice number, the sum of the order, and (optionally) add the desired parameters.After clicking on the button "Generate link" parameters will be checked and SignatureValue will be counted. After pressing the button "Check" you will be directed to pay in ROBOKASSA. In the section "Selecting a method of payment" you will be asked to choose one or another method of payment of the test order. After you press "Pay" on the page of your ROBOKASSA Personal Account it will move you to the payment page of the test ROBOKASSA site. After selecting a payment method, you can go to the payment. Or go back and choose another payment method. After you press the "Go to payment", you will be taken to a special page where you can pay the test to choose one of two possible endings: success or failure. An example of successfully passing the test payment. An example of a fail test payment. 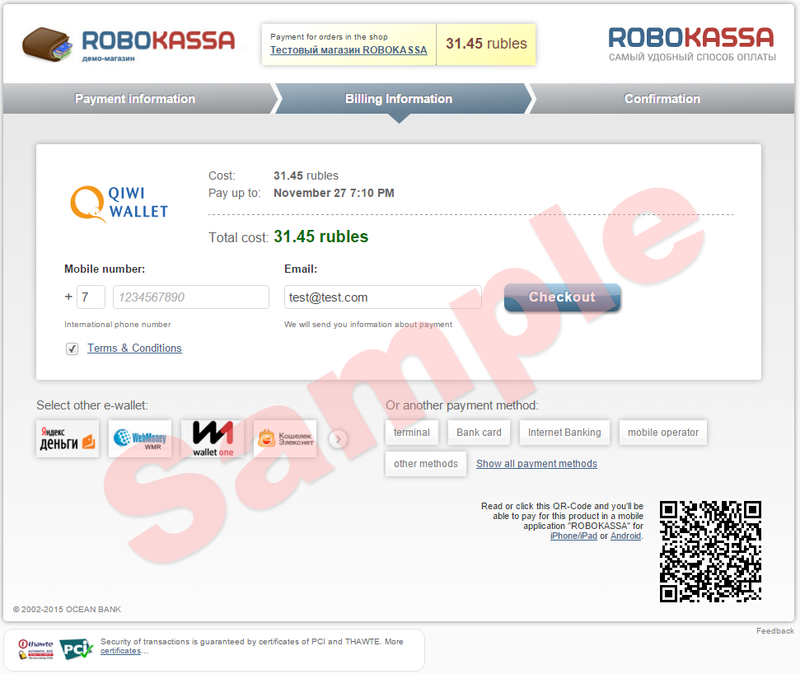 Please note that the test payments do not appear in the search operations in the ROBOKASSA Personal Account. This XML interface is needed to system debugging of an interaction of your shop/site with ROBOKASSA in the test mode. This XML interface returns detailed information about the current status and details of the payment. It should be remembered that the operation is not initiated at the time of user's transition to ROBOKASSA interface, it happens later – after the confirmation of his payment details, therefore you can not find an operation that, you think, has to begin. To test this XML interface, you should run a test operation of a payment. Means Shop Identifier, line. Details can be found here. The parameter indicates that the request to the ROBOKASSA system will be test and payment won't be made. SignatureValue – checksum or hash sum, a line of a 32-bit 16-nary number in hex format and any register (totally 32 characters 0-9, A-F) calculated by the method specified in the Technical Settings of the shop. It is generated in the line containing the mandatory parameters delimited by ‘:’ followed by Password#2 from Test payments parameters (you prescribed this password in a special section of Technical Settings): MerchantLogin:InvoiceID:Password#2. 5 – initiated, payment has not yet begun. Payment is carried out successfully, notification of successful payment sent to the shop. Date/time of the last operation state change. the sum is credited to the shop account in the OutCurrLabel currency units.